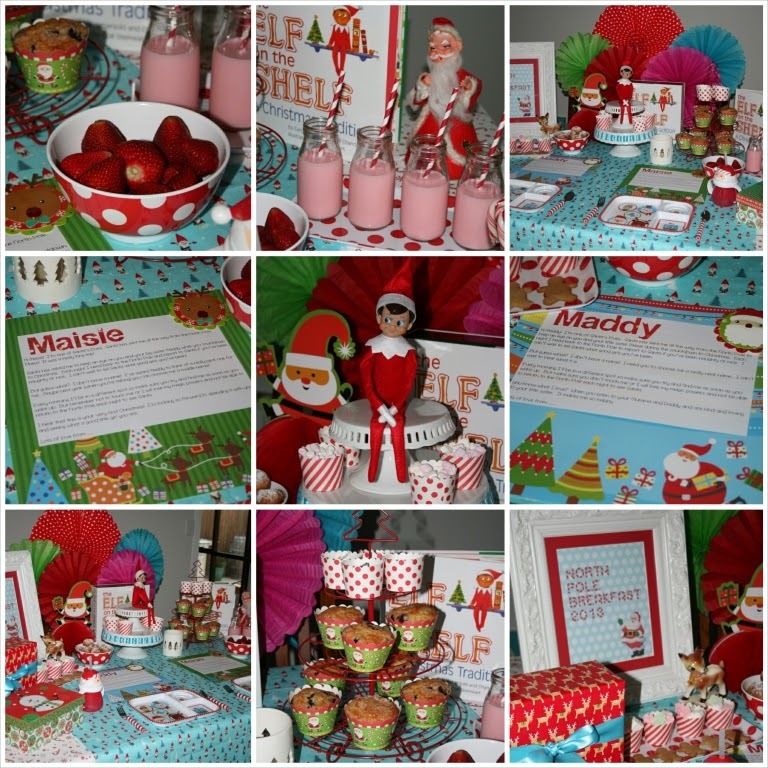 This morning we had our first North Pole Breakfast to kick off our month of Christmas celebrations and to introduce our girls to Elf on the Shelf. I actually purchased our Elf on the Shelf from Book Depository last year but Madeline was only 2 years old and I thought the concept would be lost on her. But a year later, she is right in to it. Our clever Elf had laid out a very special breakfast to surprise us. (I actually set everything up the night before and set my alarm for 6.00am so I could lay the food out before the girls got up). Elves aren't known for their healthy diets so this breakfast was a major deviation from our usual Weetbix and fruit salad. Blueberry Muffins which I whipped up the night before. They were delicious! They are also great for school lunch boxes and freeze really well. And Reindeer Kisses (Hershey Kisses). Fresh strawberries from our garden. Strawberry Milk. Spot the vintage Santa behind the milk. It was Grammys (my girls Great-Grammys). I just love it. It still has the price in shillings written on the bottom. Candy Canes - traditional Christmas treats! Snow-covered Donuts - fresh from the North Pole. Christmas tree shaped Marshmallows and tiny Gingerbread Men that I baked from the off cuts of the Gingerbread House panels that I baked earlier in the week. Our Elf had also written the girls a special welcome letter each explaining who he is, what he does and most importantly, that he needed to be given a name. Maddie ended up calling him "Ice Cream Elf". Welcome to the family Ice Cream. I made this sign earlier in the week to decorate the table. Ice Cream also bought the girls a special gift each... Christmas Pyjamas! Maisie said "Yaaaaay!" when she opened hers. So cute! A pretend gingerbread baking kit! Those blueberry muffins were a huge hit! Ice Cream and I just loved putting this all together. And the girls absolutely loved it all.